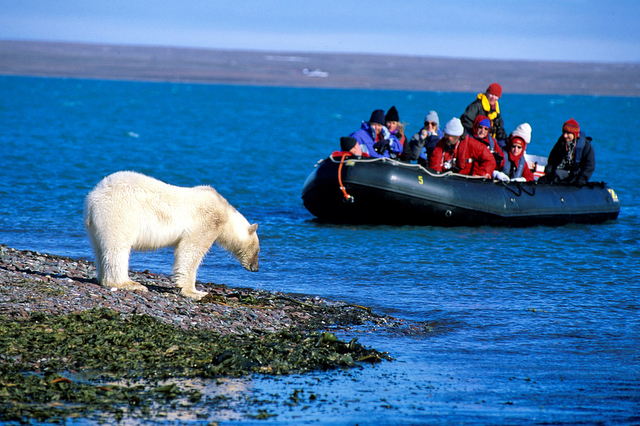 In the summer of 2008, two polar bears landed in Iceland having arrived on glaciers that floated down from Greenland. Both were eventually shot and killed, causing causing uproar across the country. A few years back, according to a story I recently heard, Iceland received a startling visitor. During the summer, some ice broke off from a glacier in Greenland. From there it began floating south carrying with it a polar bear that was either very ambitious or very unlucky; the evidence is unclear. Whatever the case, eventually the flotilla ran aground somewhere in the northeastern corner of Iceland, whence the polar bear disembarked and began, understandably, acquainting itself with the local livestock. It was during a stroll through a local village that the polar bear was spotted, citizens alarmed and authorities notified. Police arrived, got out of their cars, saw the polar bear, and got right back in: experiencing one of those wonderful moments we’ve all had when we realize: I’ve no idea what the dickens I’d planned to do next. Meanwhile the polar bear continued roaming through the village. For the context of the scene, it may be important to note that polar bears are hardly comparable to Winnie the Pooh. Adults usually weigh about 1,200 pounds, a good portion of which is muscle, teeth and razor sharp claws. In addition to being very fast and incredibly carnivorous, polar bears are one of the few species of animals known to stalk human beings for pure sport; golf courses in Alaska in populated areas are sometimes guarded by .50 caliber machine guns. It is not clear whether the man who responded to the initial distress call already knew these mortifying facts or if he quickly Googled “reasons I should be scared s$%#less when staring down a polar bear” on an iPhone from inside his locked squad car. Whatever the case, all signs point to him very quickly being aware of the present danger. Because the next time he emerged from his squad car, he did so with a high powered hunting rifle with which he was eventually able to shoot and kill the polar bear. But that isn’t the end of the story. Seeing as polar bears aren’t all-too common in Iceland, the event inevitably made headline news. And the when it did the general public wasn’t happy with the authorities gunning down such a rare and beautiful species in the middle of the street. Outcry erupted on social media, animal-rights activists lead the uproar, and the government found itself answering for what was viewed as a rash and irresponsible handling of the situation. The polar bear had, after all, never actually attacked anyone (a fact, I must note in the policeman’s defense, which is a little easier to type from a computer keyboard than articulate when smelling the bear’s breath). We’d been in Reykjavik for a little over a week and found ourselves settled into our own daily rhythm. Then Bill presented us with one of the main tasks we’d be doing during our time in the country. We’d crafted a survey regarding religion in Iceland and utilizing that survey we were to engage in conversations regarding religion with various people we met throughout the city. This made me nervous. For one, I’m an introverted person. I can make conversation with someone if I have to, like if it’s a life and death situation. You know, like we’re both stranded on a desert island or standing in line at the DMV or something. But the notion of walking up to a random stranger on the street and soliciting an unprecedented conversation is nothing short of terrifying to me. I’d rather face down a polar bear in the middle of a remote Icelandic village. To add to the nerve of these situations: I’m inevitably representing Christ in these conversations. I’m reaching out and saying things like “I’m a student from America, studying Christian theology and would just love to talk with you about what you believe.” The moment I say something like that, I attach Jesus’ name to everything I say, which includes every nervous, blubbering, dumbfounded and insensitive and downright stupid thing I happen to shoot-off in any given moment. If you’re wondering what I’m talking about, then think back to a conversation you’ve had with a non-Christian in which they’ve shared something completely stupid or insensitive that another Christian at some point did or said to them. Who would say such a thing? You might ask. How could someone who called themselves a Christian possibly do something so un-Christ-like? In answer, I tell you (and it’s not justification)maybe they were nervous, maybe they were introverted, maybe they didn’t know what to say and maybe they were really just trying. Maybe they were me. And maybe, just maybe, we Christians need grace just as much as the people we’re trying to reach. Because don’t we Christians shoot off our theology at random in conversations, sometimes without even thinking? Don’t we sometimes accomplish little other than destroying a thing of beauty, causing uproar in the name of Christ? Hasn’t the name of “Christ” too often been used to kill the reality of Christ in people’s lives? Isn’t the result of our good intentions sometimes a rash and impulsive decision that is akin to shooting ourselves in the foot? These are the questions I ask as I approach these conversations. I take a deep breath and I muster up what extroverted energy I have, muttering, “Lord, have mercy on me and this conversation” before every person I talk to. Sometimes, the conversation lasts just a few words; sometimes it goes deeper. Regardless, at the end of the time, I always mutter a prayer of thanksgiving that I escaped it without shooting the polar bear. Speaking of polar bears, the story doesn’t end there. Because within a month another polar bear arrived in Iceland. The government, having learned its lesson, hired a man from Denmark who specializes in the removal and transportation of polar bears. The government paid him the equivalent of $1 million to tranquilize the bear and take him back to his native Greenland. The specialist arrived on the scene with some local police and shot the bear with a tranquilizer gun. For a moment, it appeared as though it had worked. But then the bear reared up, angrier than ever, and charged towards Dane. Muttering something that sounded like “shoot” but swapped a couple vowels, the Dane did the smartest thing possible: run. This left the local authorities with an angry bear and no back-up plan. Thus they shot and killed their second polar bear of the summer. Which is to say that sometimes we Christians learn from our mistakes…and sometimes we don’t. Sometimes we try desperately to do the right thing and still we fall short. But in everything there is grace. There is grace in sharing the Gospel but more importantly there is grace in living the Gospel, in the stumbling, bumbling, dumbfounded, stepping upon other people’s toes and selfish mistakes we make every day. And so, as I travel around Reykjavík, nervously engaging in conversations, there are times when I may shoot-off dumb things. I hope there are not, but it may very well happen. And if it does, I rest in the fact that there is grace for me, a sinner saved by Christ. And, in the end, if it turns out this line of work just isn’t my thing, well… maybe I’ll take up polar bear extraction. I heard the last guy wasn’t too good at it. Next Post 50 Shades Of Grey Vs. The Bible: Would The Real Feminist Please Stand Up?